This book is a translation of the Arunachala Puranam, the Tamil sthala purana of Tiruvannamalai in the 17th century by Saiva Ellappa Navalar. In this work the stories and legends relating to the mountain Arunachala are narrated by Navalar in a lively style and with much poetic artifice, both of which elements are well conveyed in this translation by Robert Butler. Sri Bhagavan himself regarded it as a living history and an infallible guide to the truths embodied in the mountain and its sthala Tiruvannamalai. 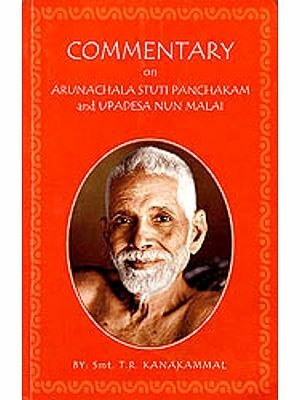 This translation of the Arunachala puranam, the sthala purana of Tiruvannamalai, composed in Tamil by Ellappa Navalar, has been translated by myself, Robert Butler, and is offered for publication to Sri Ramansramam naivedya to Bhagavan Sri Ramana Maharshi. A short chapter has also been included which reflects on Bhagavan's relationship with the mountain Arunachala, which as the living embodiment of Lord Siva himself, was throughout his life his one and only guru. 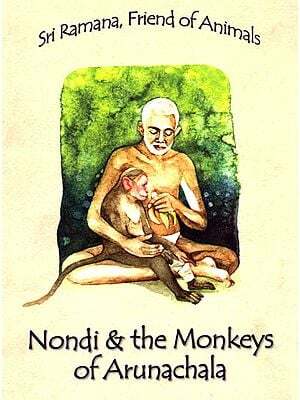 Although the principal aim of this book is to bring to the reader an accurate translation of the Arunachala Puranam, I felt in it would be a wasted opportunity to present it without reference to its major source, the Arunachala Mahatmaya, a section of the Sanskrit Skanda Purana. I would add that, in view of the importance and esteem accorded it by Sri Bhagavan himself, some treatment of its content is all the more desirable. Therefore a short introductory chapter has been added, which compares these two major works, pointing out some of the differences and similarities in their respective treatments of the Arunachala story. Some quotes from the source work are also included as notes within the text itself. In many cases, when the Mahatmaya is quoted, the original Sanskrit text, in transliterated form, is given alongside the English translation. For those who know Tamil, copies of the Tamil text are easily available, and there is therefore no need for lengthy quotes in that language. However, it is quite likely that the vast majority of those who know some Sanskrit will never have access to the actual Sanskrit text. Hopefully these quotations will enable such readers to get some feeling for the beauty and power of the language and style of the original. The Arunachala puranam is the sthala purana of Tiruvannamalai. A sthala purana is a work which brings together all the legends relating to a particular holy place, or sthala, as they are known. It was composed in the17th century by Ellappa Navalar. Most sthala puranas, like the present one, are relatively recent in composition, but the myths and legends they contain form part of an unbroken tradition elaborated, legends they contain form part of an unbroken tradition, elaborated, embroidered and transformed over several millennia, beginning with the Vedas, and the vedic commentaries, the Brahmanas, and culminating in the puranic period with the two great epics the Mahabharata and Ramayana, the eighteen major Puranas, and the numerous minor Puranas, known as Upapuranas. Their subject matter is nothing less than the history of the Upapuranas. Their subjects matter is nothing less than the history of the universe and everything in it as seen by Hindu society. To read the Arunachala Puranam, modest in scope though it is, is to take a cross-section through over two thousand years of the evolving sensibility of Hindu society. In the arunachala Puranam, the main story unfolds against the background of epic themes such as the creation of the universe, and the battles for supremacy between the gods themselves, and the battles for supremacy between the gods themselves, and the gods and their enemies, the asuras. 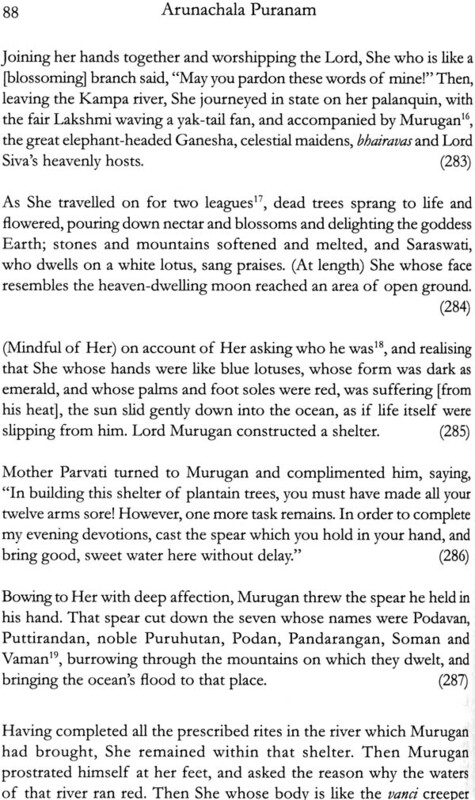 Two majorthemes are interwoven: the first is greatness of the Arunachala sthala, and the story of how the mountain Arunachala first manifested as an unfathomable pillar of fire, to settle a quarrel between brahma and Vishnu; and the second is the story of how Siva's consort Parvati Came to merge with Lord Siva as half of himself, as the merged deity Ardhanariswara. As these two strands merge, the ultimate sanction of the sthala's greatness is given as Lord Siva chooses it as the place where he will reveal his non-dual nature, and unites indissolubly with his own creative energy, as personified by Parvati. One of the major purposes of the sthala Purana, of course, is to attract pilgrims by giving details, not only of what spiritual benefit might be gained from visiting it, but also providing information on its geo-graphical location and features, and so on. Much information of this kind can be gleaned from the Arunachal Puranam. Information is given in the notes identifying where possible the lesser known sites and locations. Until now, no full translation of the Puranam has been available. It is hoped that this book, in addition to its literary and spiritual value, will have some practical use for those who visit Tiruvannamalai, giving devotees a comprehensive view of the Arunachala sthala and its legends as a whole, and will help them gain a fulle and deeper appreciation of the stories that are given piecemeal in other sources, such as the recorded conversations of Ramana himself. Saiva Ellappa Navalar This work is generally attributed to Ellappa Navalar, or Saiva Ellappa Navalar, as he is also known, although some sources cite as the author Ellappa Nayinar who lived in the previous century. It was not until the 20th century that it was definitively established that the two were different people. He is thought to have lived in the reign of the Tamil king Tirumalai Nayakar, whose dates are 1623 – 1659. His birthplace may possibly have been Tiruvannamalai, but whether it was or not, he is thought to have spent many years there in a mutt or math, which is the Hindu name for a monastic or similar establishment. Others give his birthplace as a place called lratanallur, near Tiruvenkatu. Others think he may have been born in Jaffna origin that are found in his works. He si said to have belonged to the Velala caste, who were powerful agricultural landlords, the aristocracy of the Tamil society of that time. it is also said that at an early age he was sent to Dharmapura atinam, an important Saiva mutt in the Tanjore district, where he received initiation into the Saivate faith, and attained great literary and linguistc skills. In addition to the arunachala puranam, he composed a number of other Puranas, and composed two long poems which are both extant, the Arunai Antati and the Arunai Kalamakam. The latter of these, a long poem in mixed metre and written in the style of Tamil Akam Poetry, is particularly highly regarded. Readers of this translation may have gathered that Ellappa was very fond of the pun as a figure of speech. The following verse from the kalampakam illustrates how he often use this device to bring a touch of lightness and humour to his serious of threatening to dress up a Palmyra branch as a horse, with flowers and bells and so on, and ride it through the village street, holding a picture of his beloved and proclaiming her cruelty for all to hear. In this verse, Siva is imagined to be rejecting the idea of riding the palymra horse on the grounds that those who desire a pennai – woman as part of themselves will have no desire for a pennai – Palmyra. Desires to unite with a pen (nai) as half of Himself. Would he cut [a branch] from some other kind of Pennai, then? The author of the Tamil Arunachala Puranam, in verses 21 and 514, cites as the source for its first 7 chapters the Rudra Samhita (514), or the Kodi Rudra sambita (21) of the Siva Purana. For the remainder of the work, he cites the Linga Purana. It may be noted that the Rudra Sambita is more usually described as an 'unofficial' non standardsection of the skanda Purana, not the Siva purana. It is not at all clear to which text the author is referring, some texts divide the Skanda Purana into sections called sambitas. Ellappa could therefore be using the name Rudra Sambita simple to refer a larger section of the Purana in which my mahatmya is located. At the time of writing Purana was available to the translator, and therefore and discussion of their role as a source for the present work will have to await a later edition. There is though one work which stands out as an obvious source for the majority of the material directly related to the mountain Arunachala and this is the Arunachala Mahatmya – The Greatness of Arunachala. 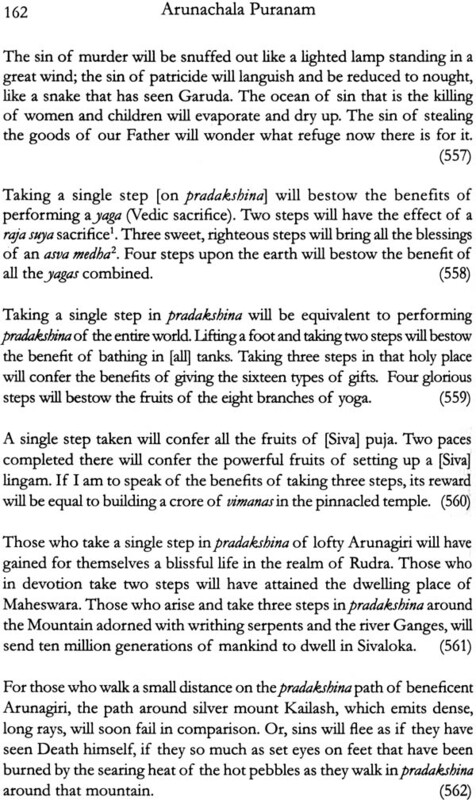 The Arunachala Mahatmya is a section of the Mabeswara Kanda of the Sanskrit Skanda purana. In actual fact Arunachala Mahatmyam consists of two sections called the Purvardha and Uttarardha, each of which relates the same material, but in a different order, with variations of detail and emphasis. 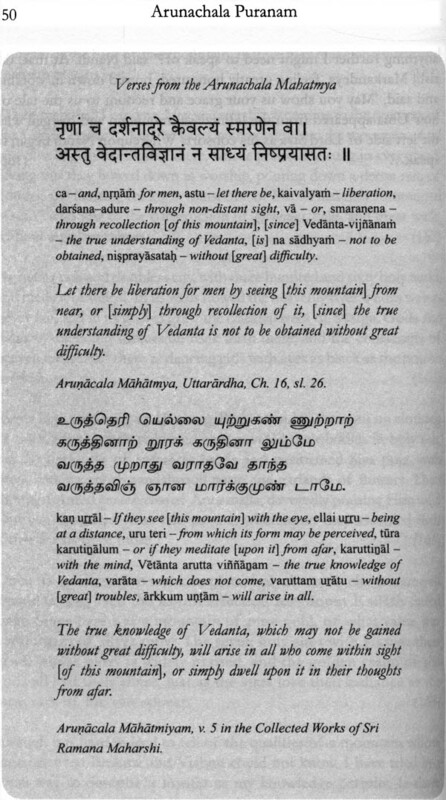 In some places the Tamil Arunachala Puranam provides a near word for word transaltion for material in one or other of the Mahatmya sections; elsewhere there are quite wide divergences, as the author appears to embroider material that is only mentioned in a cursory manner in the Mahatmya, or skips over material that is treated more fully there. 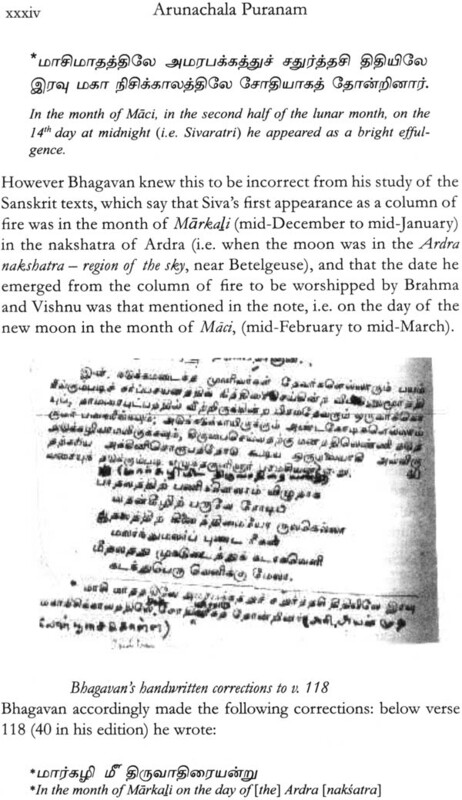 Wabtmya, original text or texts the author, Saiva Ellappa Navalar, worked from, it is hard to imagine that their content differed widely from that of the work we now as the Arunachala Mahatmya. 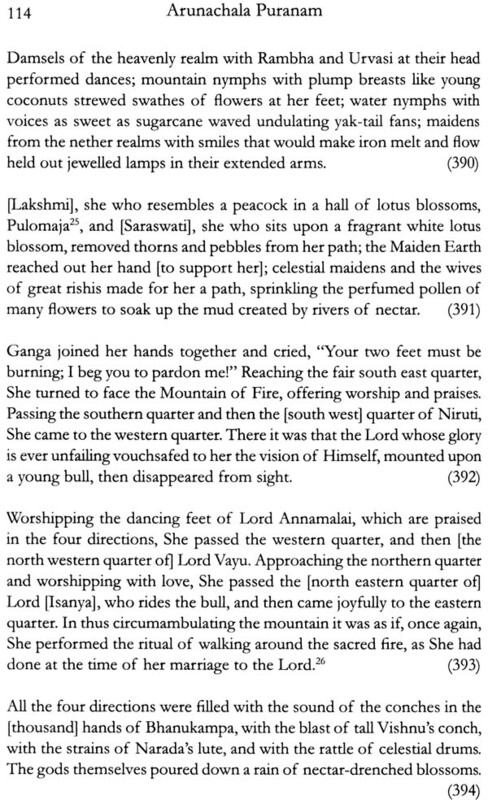 The fact that the title of the work refers specifically to the greatness of Arunachala, and the fact that it consists of a collation of two accounts, different is style and clearly by different authors might lead one to conjecture that the Mahatmya may well be a digest of all the relevant material relating to Arunachala, gathered together from disparate sources, either within the Skanda Purana itself, or other Saiva Puranas, such as the Siva Purana and Linga Purana. There is one major them which does not form part of the Mahatmya but is dealt with in detail by the Arunachala Puranam: this is the destruction of Daksh's sacrifice, the death of Sati, and the subsequent events which lead up to Rarvati's marriage to Siva, including the burning up of Kama. These events are not mentioned at all in the first part of the Mahatmya, and in the second part, are merely summarised in a few slokas, as a cursory recapitulation for hte benefit of the reader, (Uttaradha ch. 17, 1-11). This is of course one of the major stories connected to Siva, and is told in a number of Puranas and other texts, principally the great Siva Purana itself. To his credit Ellappa relates the story with great gusto and poetical artifice as his third chapter, making it an excellent launching Pad for the next two large chapters, which lead up to the merging of Parvati with Lord Siva.